Federal Premium Vital-Shok is a leader in the world of Ammunition for hunting big game, medium sized animals, varmints, and small game. 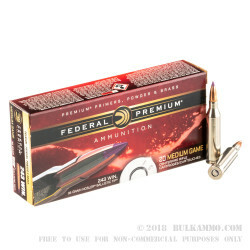 The Federal Premium Vital-Shok .243 Winchester round is ideal for medium sized game animals like deer and big horn sheep for any distance. These .243 Winchester rounds are topped with the accurate, hard hitting Nosler Ballistic Tip hunting bullet. 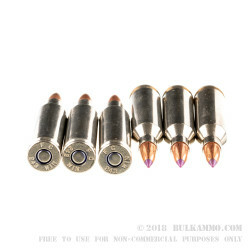 With its 95 grain Nosler Ballistic tip boat tail bullet, reloadable high polished Boxer primed nickel plated brass case, hot Federal primer, and premium powder, this round rips through the air at a muzzle velocity of 3025 feet per second, hits the game at a muzzle energy of 1930 foot pounds, and carries a ballistic coefficient of 0.378. 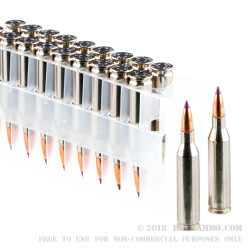 The Nosler Ballistic Tip bullets these rounds are topped with have a polymer point that has a different color assigned to each caliber, the polymer point also starts the expanding “mushroom” effect of the bullet by pushing into the lead core and tapered jacket upon impact. The rear of the Nosler BT bullet is a “Ballistically Engineered” boat tail design with a solid one-piece copper jacket and base that aids in the bullets terminal performance. The 20 round box is ready to accompany you on your next hunting excursion.